Aptamers are single-stranded oligonucleotides with high affinity and specificity to the target molecules or cells, thus they can serve as an important category of molecular targeting ligand. Since their discovery, aptamers have been rapidly translated into clinical practice. The strong target affinity/selectivity, cost-effectivity, chemical versatility and safety of aptamers are superior to traditional peptides- or proteins-based ligands which make them unique choices for molecular imaging. Therefore, aptamers are considered to be extremely useful to guide various imaging contrast agents to the target tissues or cells for optical, magnetic resonance, nuclear, computed tomography, ultrasound and multimodality imaging. This review aims to provide an overview of aptamers' advantages as targeting ligands and their application in targeted imaging. 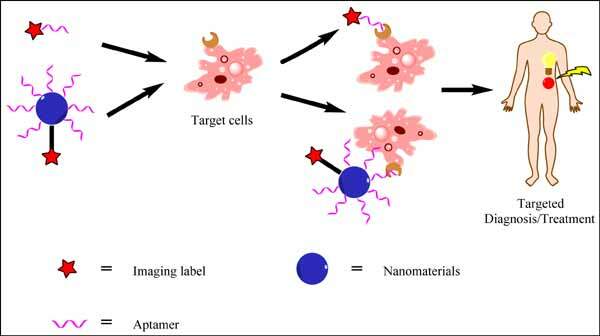 Further research in synthesis of new types of aptamers and their conjugation with new categories of contrast agents is required to develop clinically translatable aptamer-based imaging agents which will eventually result in improved patient care. Aptamer, Molecular imaging, Nanomaterials, SELEX. Department of Radiology, University of Wisconsin - Madison, Wisconsin 53705-2275, United States.